Hello everyone and welcome to the first ever issue 13 of the Spirit Spotlight, the write up of the best spirits you can find at the Dial. This month we are looking at Neft vodka, a Russian made vodka whose name simply mean oil, in honour of the resource that brought the creators prosperity. First let’s head back to the Russian mid 70s, where there was an emergence of oil fields in Siberia. Three young Russians adventured to the remotest areas in search of the black gold. They pushed through their own mental and physical limits every day, surviving in the most extreme and brutal conditions. Few things helped them cope, one of which was drinking vodka with their meagre meal rations. Vodka helped to lift their spirits in this unforgiving area, but they knew vodka could be better. With the success of the oil rush, these three men had the means to distil their own high grade vodka in the way it was supposed to be, In their own vision. Vodka for oil men, by oil men. The men that made Neft admit that they “are no saints”. They simply drank vodka when they were younger and knew what good vodka should taste like. They wanted to make the best tasting vodka that made the least harm to the body and environment. So they set out to use the best ingredients in the vodka and to keep the packaging simple, efficient and recyclable. They don’t claim to use any gimmicks or added flavourings, this is pure premium vodka, through and through. They took their formula to Austria, to combine their knowledge with Austria’s grain and fresh spring water. Always ensuring that it is distilled and filtered to the right level. The proof is in the taste, Neft uses the highest quality ingredients and goes down smoothly. 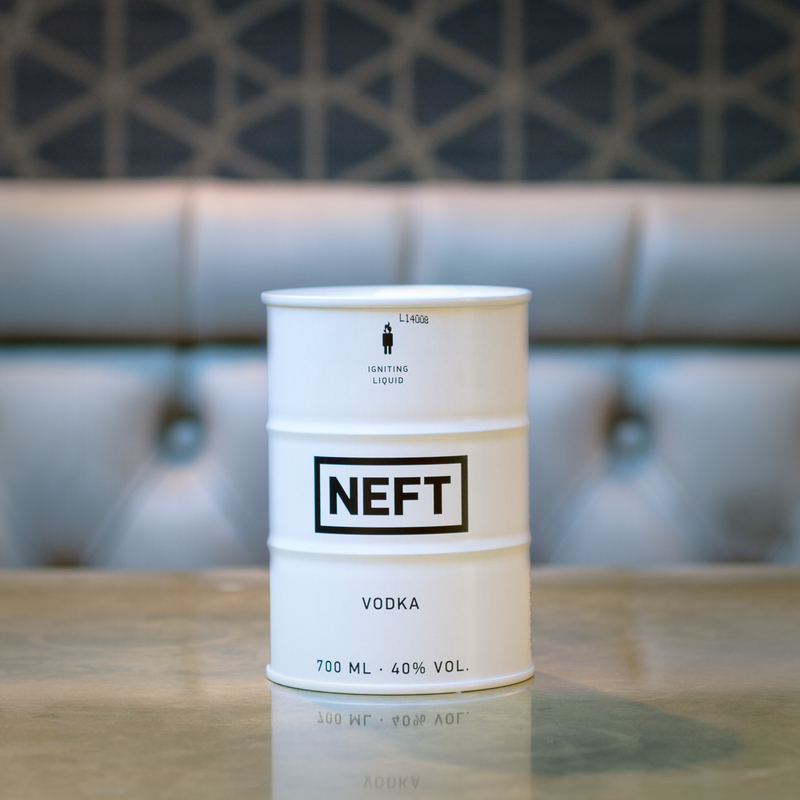 Neft vodka comes packaged in a quirky miniature oil barrel, made to be recyclable and efficient. It’s certainly eye catching and stands out from the myriad of bottles found out there. The packaging also ensures it stays sealed and protected from anything that may affect it. Simple things like sunlight can affect the contents of a product. Add ice stir and enjoy! Thats all for Spirit Spotlight this month, if there are any spirits you would like us to take a closer look at, let us know on any of our social media sites. Until next time, see you at the bar.